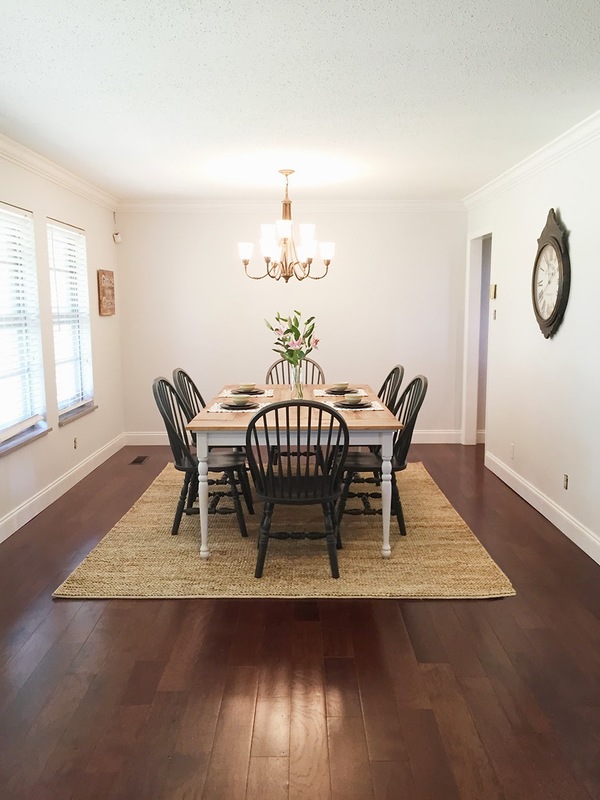 Last week I posted all about Brittany’s Rancher Reno, and if you didn’t see it, please take a moment and treat yourself to some inspiration by clicking here! 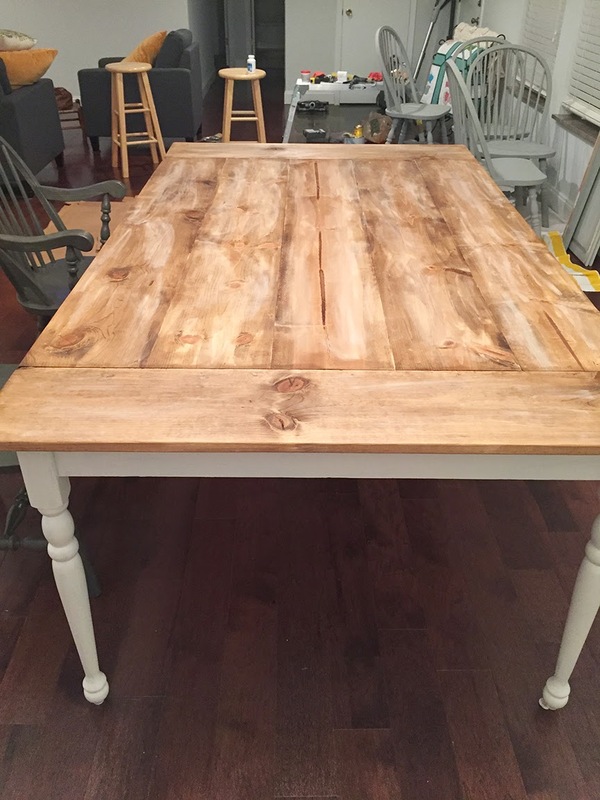 All of it is fabulous, but one of the best projects is the farmhouse table. I promised to give you the steps my brother took from the before to the after, so here it is! Because she wanted a more up-to-date farmhouse look, my brother (her handy boyfriend) took on the challenge of the transformation. 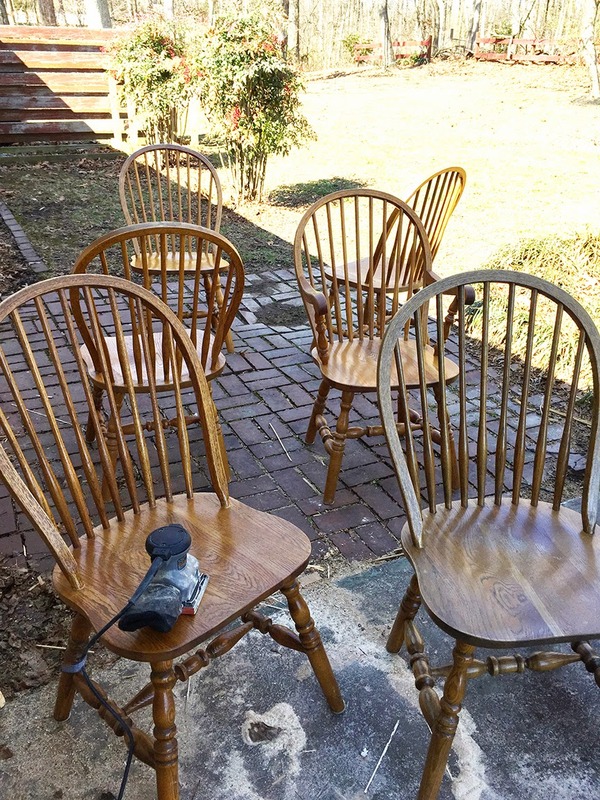 He started with the chairs, sanding each of them carefully. 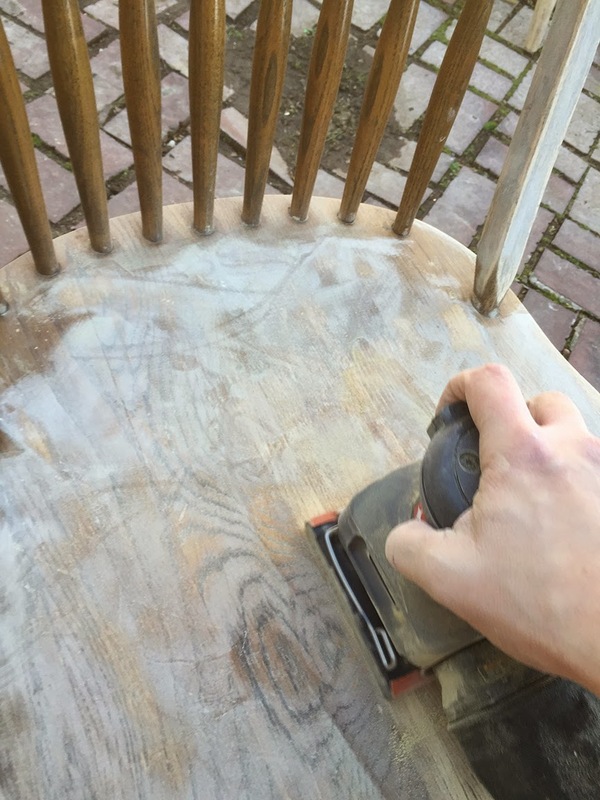 David used a light sanding block on the spindles of the chairs and the parts that would not be getting lots of wear. 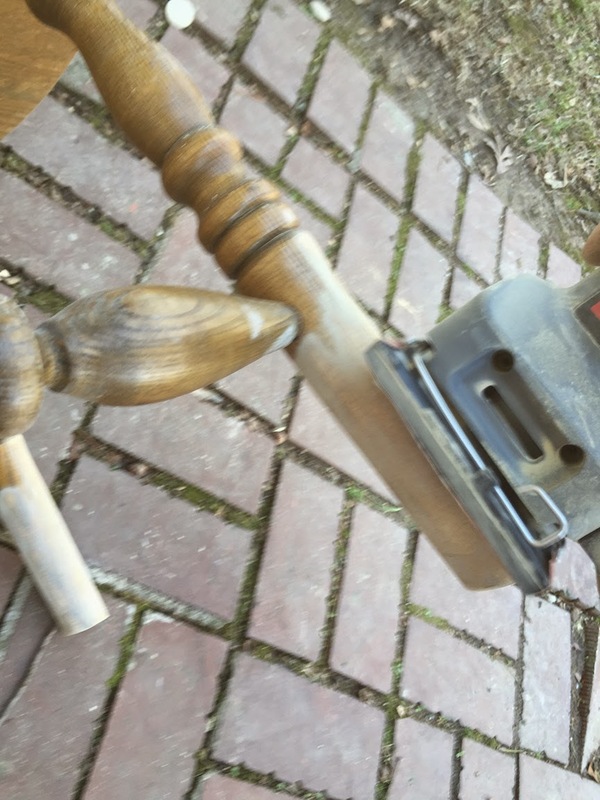 But on the seat, the lower legs, and the tops of the chair backs, he used a power sander, sanding almost down to the wood, to give the primer and paint the best adhesion. Power sanders are so handy when doing large projects like this, and they aren’t that expensive either. This Skil Octo Sander is the one I use and I love it because of the pointed tip front that can get into smaller areas. And it has several other great features as well. After all the sanding, David just wiped them all down with a slightly damp cloth to remove all the dust. Here’s a tip: Don’t get the wood too wet in this step, because it needs to be completely dry before priming. 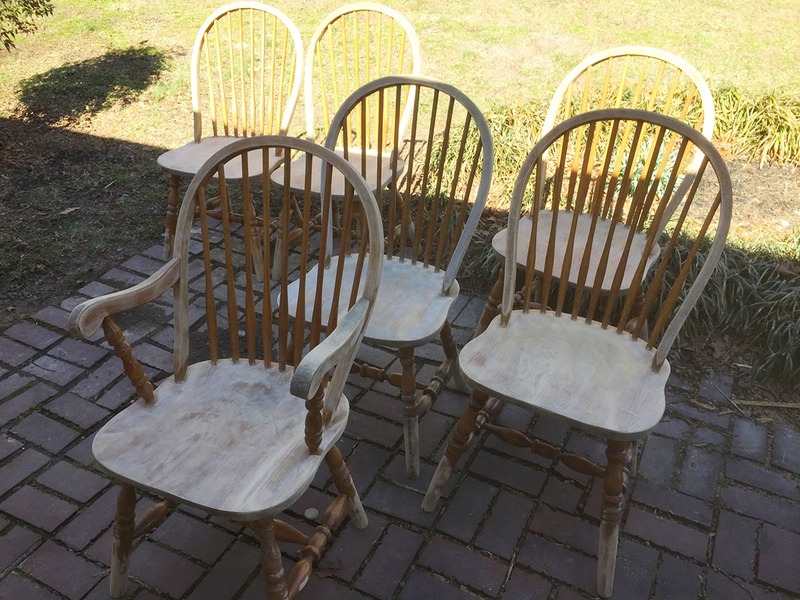 You can spray chairs like these if you have a nice sprayer, but David brush-painted these, and with a few of his tips, they will turn out smooth and streak-free. First of all–he recommends using the best oil-based primer you can on stained furniture to save yourself from trouble later. 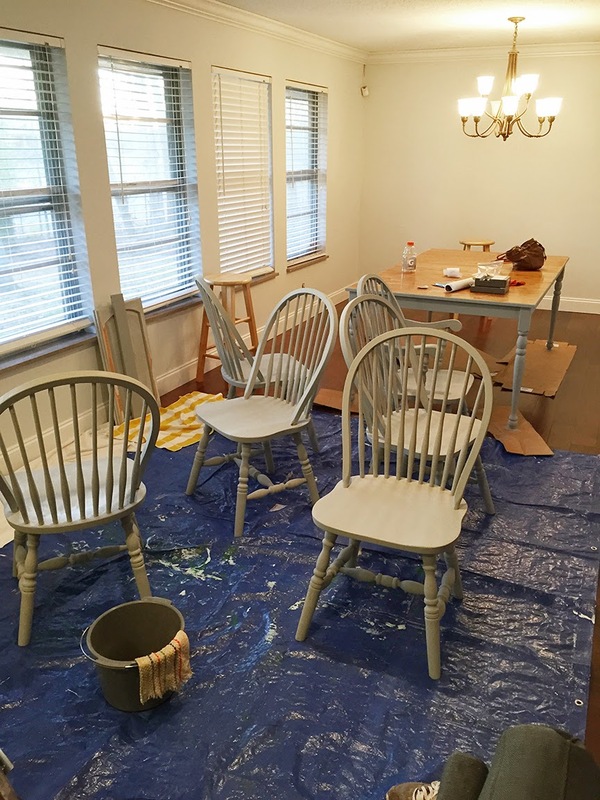 He used Sherwin-Willam’s Fast Drying Primer on the cabinets in the kitchen, and had enough for the table and chairs as well. This primer is pricey, but worth it in the long-run. 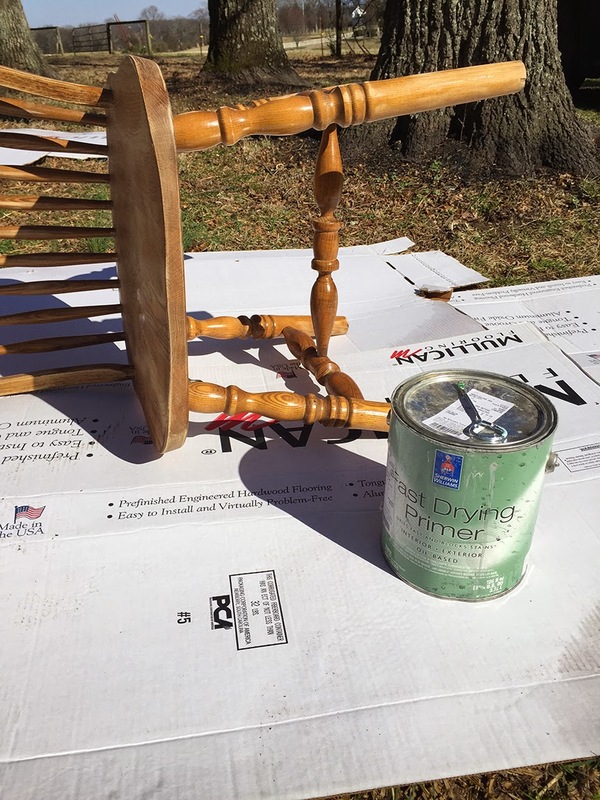 He painted one coat of the primer on to each chair, waited for just about an hour, then went back with 2 coats of paint. Some experts say that the painting process goes better when you just wait that hour before painting rather than a full 24 hours. The color he used for the chairs was Sherwin William’s Urbane Bronze in a satin finish. If you’re going for a rustic or farmhouse look, you won’t want a high sheen. David shared one extra tip that will really make a difference in the finish and give a very smooth finish when brush-painting, and that is to add just a small amount of Floetrol to your paint and mix well before painting. You can find it here or at a local hardware store. He loves how this product works. 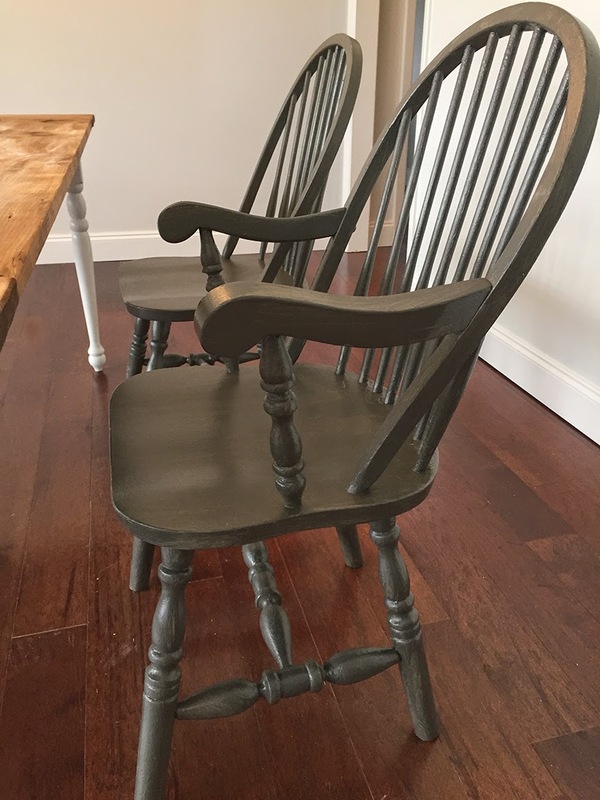 Although we recommend using Sherwin William’s Pro-Classic on furniture, which is meant for wood and trim, David used their Duration paint on these because this dark color could not be mixed in the Pro-Classic. The Floetrol works like a charm to help the paint level out and give a smooth finish. I love these to death and think they turned out amazing! As for the table, he followed the same process for the table base as he did the chairs. The paint color on the table base is SW’s Shoji White. After painting, he constructed the top with 1×8’s from Lowes. 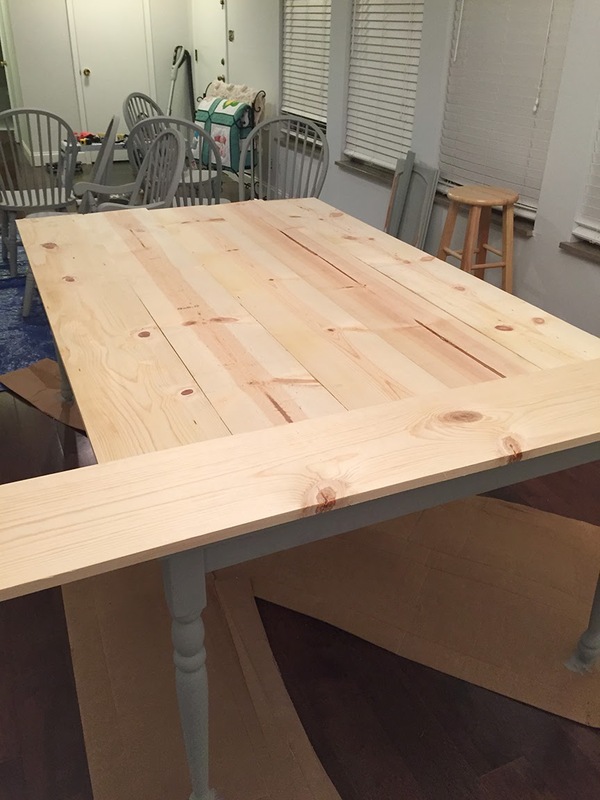 He measured the existing table top and cut the boards to fit so there would be a one-inch overhang over the original top all around. He patterned the boards with 5 going length-wise and one on each end. They did not want to over-ly distress the wood, but rather just sanded the tops and edges to make them less sharp and more rounded. Once they were cut and sanded, he placed the boards exactly where he wanted them and then turned each board over, one at a time, and generously applied Liquid Nails to the bottom to adhere it in place. When each board was done, he nailed the boards in for extra stability. He chose to nail them in from the top so the nail heads would add a little extra character, but you can also screw the top in place from the bottom up. 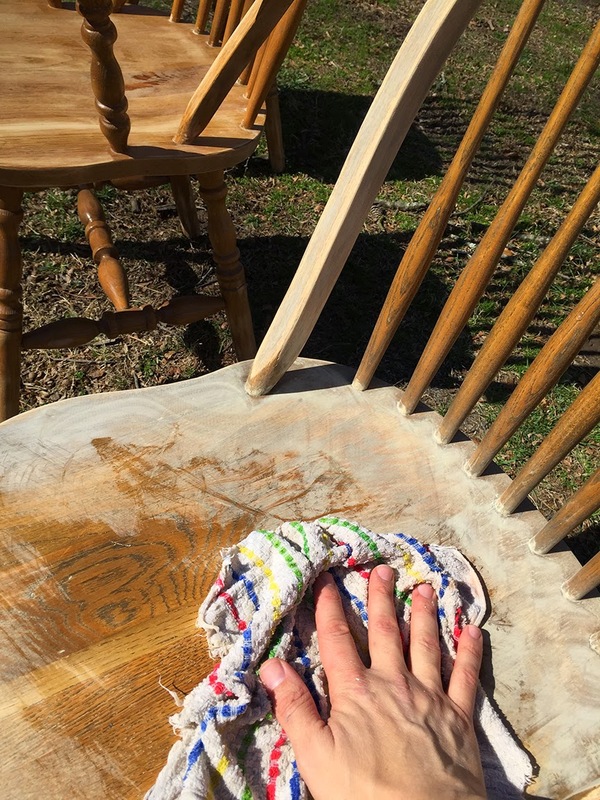 As for finishing, David used this Minwax Early Americanstain, and applied it with a rag, wiping it on, then immediately wiping it off, so as not to have a heavily stained look. For a little more weathering, he mixed a little of the SW Gray Matters paint from the cabinets and lightly rubbed on a few streaks in various places. After letting that dry overnight, he gave it 2 coats of a low-sheen polyurethane, letting dry an hour in between. It really did turn out beautifully, and the whole project only cost about $100. 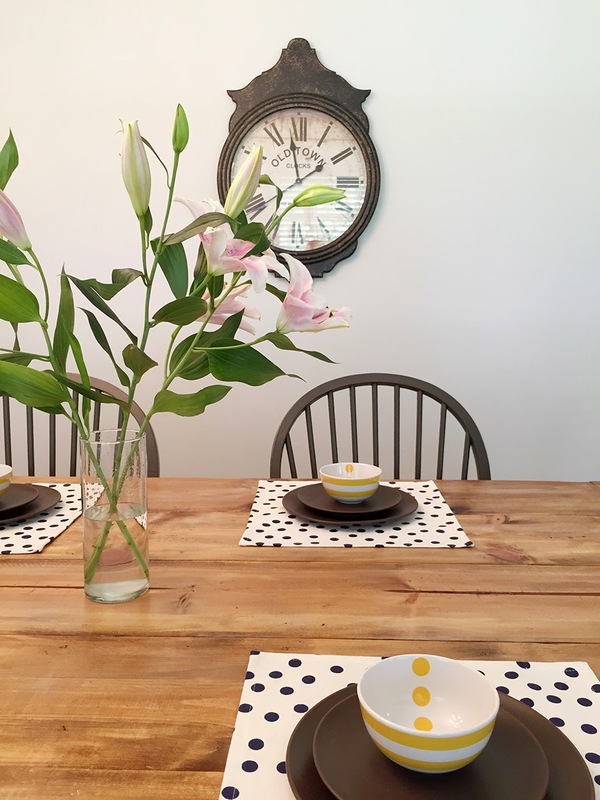 Does this inspire you to give an old table a face-lift? Let me know if you give it a try! Big thanks to David for sharing this process and taking pics all along the way so I could share them with you. I’ll let you know what he ends up doing next! 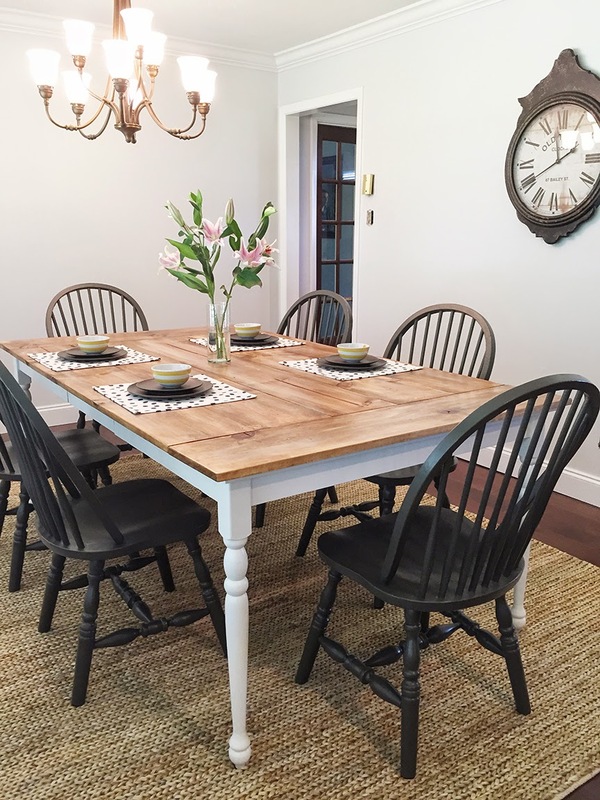 This entry was posted in Uncategorized and tagged Brittany's Rancher Reno, David, Furniture Redo, Painting. Bookmark the permalink. Follow any comments here with the RSS feed for this post. Post a comment or leave a trackback: Trackback URL. I am completely in love with this set, I hope to have a similar one in my house one day! So, so much better. Wow, great project. So glad you like it!! Hope yours turns out just like you want!! love your table and also the rug! Can you tell me where you got your rug? I just realized I never answered. They got it from Tuesday Morning! Sorry! 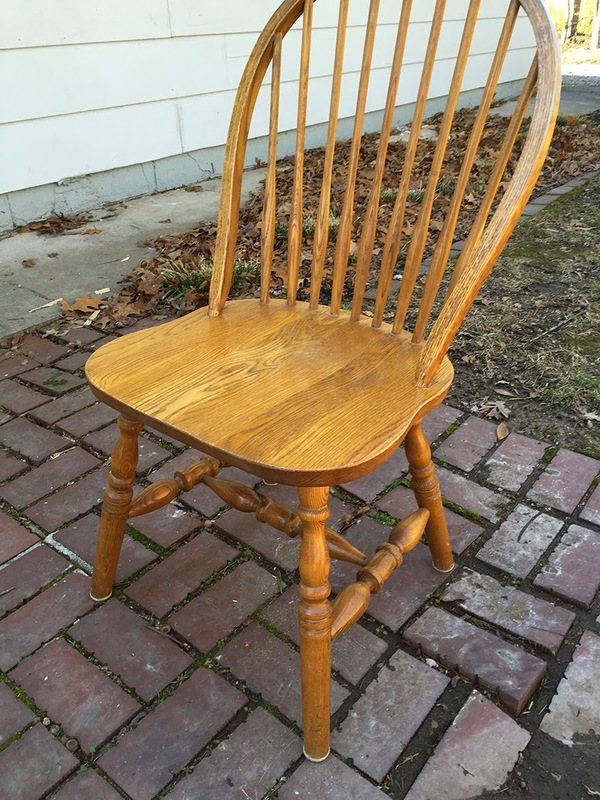 For the chairs i have the same ones and painted the backs and legs white and wanted to re stain the seat part, do i sand it then wipe it off then stain it? Yes, that would be the thing to do! Found this post a week ago and inspired me to do the same! I have my planks cut to size, sanded and ready to glue down on the existing table top, only i worry its too heavy. How has your table held hp? Did you need to reinforce anything? This table has held up great! Have you used the 1″ planks? Also– are your table legs at least as large as the ones on this one? If so, the table should be fine. If you have more questions, feel free to email & send pics! Good luck! What type of wood are the planks? 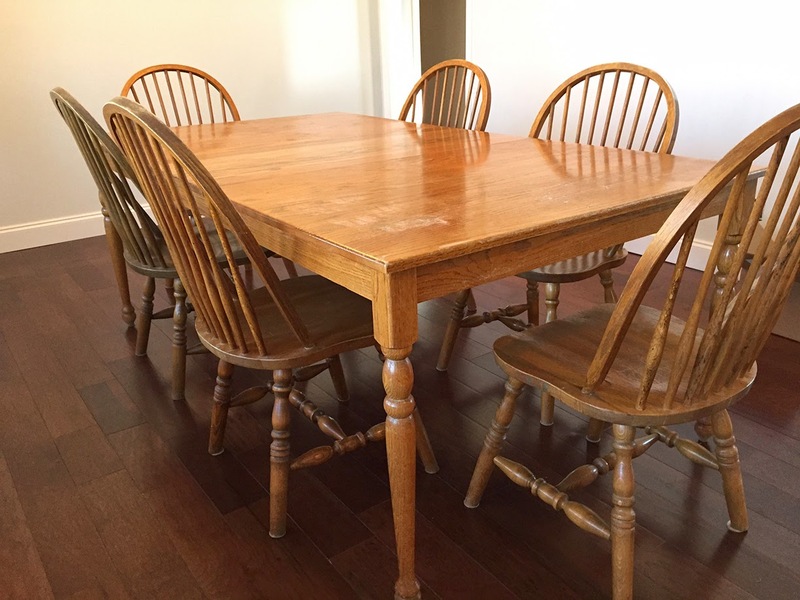 I made a similar style table but my stain turned out blotchy – considering re-sanding and starting over. Did you use a pre-conidtioner? The wood is 1″ pine. No conditioner. Just make sure you wipe the stain on smooth and wipe off any residue! Hope that helps you! Love your table! Have any of the boards split or have the seams separated at all? Wanting to do this to my table as well but have read wood wants to expand and contract with weather changes and it’s best not to glue tho I prefer to glue down so it’s more solid. Sorry for the delay in response to this. Somehow this must’ve slipped through without me seeing! There have been no changes in the table the way it was done here. So glad you like it. So in the picture it almost looks like the chairs are black but in the photo from the project they look way lighter. Am I missing something? I think you are referring to the primed chairs. 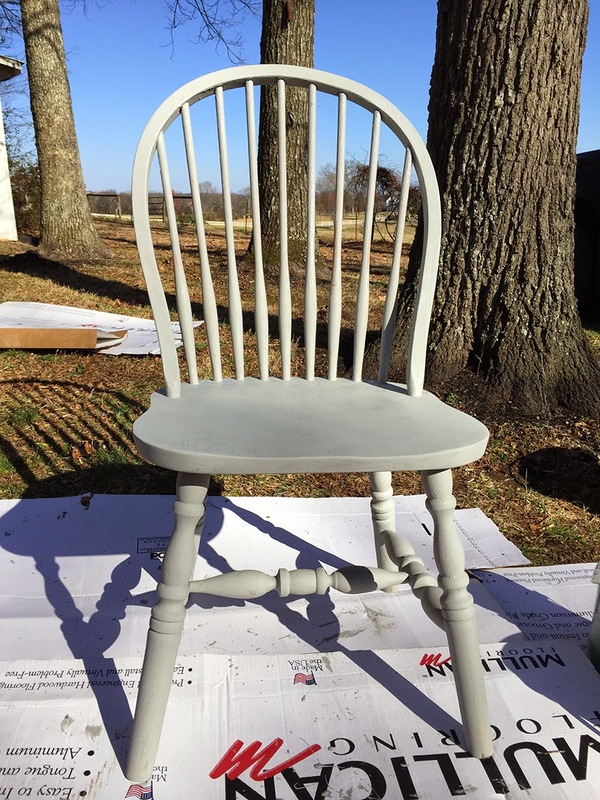 The grayish look is the paint primer and the darker version is the finished painted chair. Hi! It looks stunning! We have an almost identical dining room table that I am about to do this to. Did he remove the existing table top or just put the planks over it? Just put the planks over! 🙂 Glad you like it!